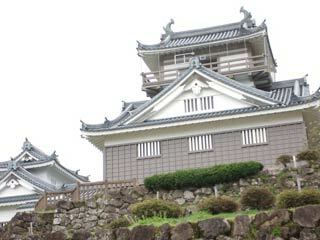 Echizen Ono Castle (越前大野城) is a hilltop castle located in Ono. It was built by Kanamori Nagachika in 1576. The layout of the castles, stone walls, moat and dirt hills are preserved in the great condition. There is a reconstructed Tenshu-kaku which has great view of Ono field. Admission for Tenshu-kaku: 200 yen, free for kids. Built in: 1576 by Kanamori Nagachika. In 1575, Oda Nobunaga gave Kanamori Nagachika the land of Ono for his work of defeating Ikko Riot at Echizen. He built castle on the top of Mt. Kameyama which is 249m high. The stone walls of the first bailey are preserved in great condition. In 1795, Tenshu-kaku was burned down, and never rebuilt again. Current Tenshu-kaku was reconstructed in 1968. It displays the historical items of the lords of Ono.